Welcome to K & S Music's Reverb store! We have been serving the music community for over 30 years. Please keep checking in for great, unique items and fantastic deals. Thanks for stopping by! 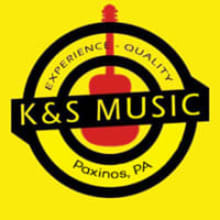 K&S Music, Inc. is a retail musical instrument and accessory store located in Paxinos, PA. We carry a variety of products for the beginner to the professional musician, including acoustic and electric guitars, bass guitars, amplifiers, DJ equipment and lighting, drums, cymbals, PA equipment, accessories and plenty more. Equipment rental and instrument lessons are also available. Hours of operation are 12:00pm to 8:00pm Monday, Tuesday, Thursday and Friday; 12:00pm to 4:00pm Saturday; closed Wednesday and Sunday. K&S Music has been an idea of David Berkheiser that started back in 1981. He envisioned a local music store where musicians, beginners to professionals, could meet and talk with other musicians while shopping for instruments and accessories at the best possible price – an operating principle still in effect today. We ship via UPS and USPS, depending on the size and weight of the item. If you have a preferred shipping company for your item, please contact us. We will accept returns within 14 business days. Buyer is responsible for Shipping charges back to K&S Music, Inc. If a return is initiated, the buyer will be refunded less the original shipping charge. A minimum 10% restocking fee may also be charged depending on the item. If an item is returned in a condition lesser than it was when leaving K&S Music, additional restocking fees may apply. Please also return in packaging the item was sent in. Microphones and Harmonicas will have an extra 20% restocking fee to cover cleaning and sanitizing costs. Apparel, ear plugs, and headphones cannot be returned due to hygiene reasons.